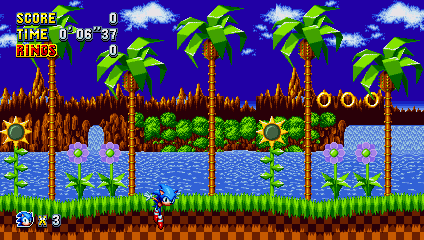 After almost 23 years, classic Sonic gameplay returns in all its 2D pixel-perfect glory. Designed as if it were a Sega Saturn followup to the Genesis-era titles, Sonic Mania features a mix of brand-new stages and remixed classics, with a hearty dose of references to other Sonic games (even the OVA gets a nod!) and other Sega stuff in general. It also launched with a game breaking SteamAPI-Denuvo-conflict bug on PC, which didn't go down well to say the least. 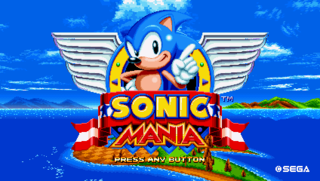 In 2018, the game received an upgrade/DLC expansion in the form of Sonic Mania Plus, adding the long-absent Mighty the Armadillo and longer-absent Ray the Flying Squirrel as new playable characters, a special Encore Mode, a physical release with an artbook and reversible Genesis/Mega Drive cover for added nostalgia points, and other goodies. Verify codes/controls for PS4 and XB1 versions. Verify non-menu content for PS4, XB1, and Switch when possible. 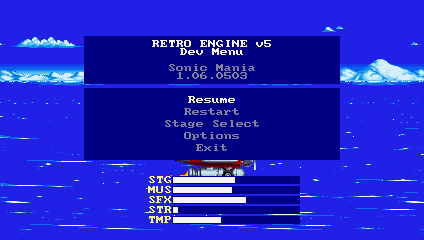 By opening the Developer menu in the 1.04 and higher versions of the game's menu, if you go to the debug flag, the debug option will be replaced by a "Diorama Alt" option. If you change the values, the "Mania mode" scene will change. I would write this myself, but i don't know how i could implement videos and images. If somebody could, that would be great. The scratchpad sections are even bigger than the normal stages! Revised bosses, added transitions, and more! Place the cursor on the "No Save" portion of the file select menu, hold one of the following buttons/keys according to your version, and press Start. However, the Debug Mode (which can be unlocked by collecting at least 16 medals from the Blue Sphere bonus stages) must be enabled for this code to work. In v1.0 of the Switch version, you can also access the level select from the title screen by holding Y and pressing any other button. D-Pad / Arrow Keys: Navigate through the menu. ◻ (PS4) / Y (Switch) / X (XB1) / Q (PC): Switch between Sonic, Tails, and Knuckles (and if playing the Plus version, Mighty and Ray) as the player character. △ (PS4) / X (Switch) / Y (XB1) / W (PC) when Sonic is selected as the player character: Toggle Sonic & Tails. ◯ (PS4) / A (Switch) / B (XB1) / A (PC): Play highlighted level/selected Sound Test entry. Debug Mode is automatically enabled through this menu. ◻ (PS4) / Y (Switch) / X (XB1) / Q (PC): Enable/disable debug placement mode. ✕ (PS4) / B (Switch) / A (XB1) / A (PC): Cycle forward through the available objects. △ (PS4) / X (Switch) / Y (XB1) / W (PC) while holding the above button: Cycle backward through the available objects. ◯ (PS4) / A (Switch) / B (XB1) / S (PC) when selecting an item monitor: Change the item monitor's contents. D-Pad / Arrow Keys: Move currently selected object around. △ (PS4) / X (Switch) / Y (XB1) / W (PC): Place currently selected object. A set of debug coordinates also appear at the top-right corner of the screen when debug placement mode is active. The top 8 digits are the X and Y coordinates of the camera, while the bottom 8 digits are the X and Y coordinates of the player. 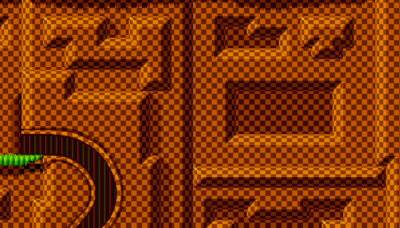 This mode can be found if you use Debug Mode with Tails in Mirage Saloon in Sonic's Act 1. Place a signpost; then, if you're lucky, you will be taken to Knuckles' Act 1 and the mode will be activated. ✕ (PS4) / B (Switch) / A (XB1): Increase movement speed of camera if held. In the PC version, by adding "devMenu=1" to the "[Game]" section of Settings.ini, and pressing the ESC key in-game, a hidden developer menu is displayed. By extracting the contents of Data.rsdk into a Data folder (and removing the Data file from the Sonic Mania installation folder), you can still access the Dev Menu. Resume: Exits the debug menu. Presentation: Small scenes related to starting and ending the game. Logos: Developer logo splash screen. Title Screen: It's the title screen. Wow! Menu: Goes to the main menu, in case this dev menu isn't exciting enough for you. Level Select: Jumps to the fancier level select screen mentioned previously. Credits: Goes to the credits. Continue: Continue screen seen in the No Save mode. By default, it plays the Sonic and Tails continue screen. Simply pressing the "Jump" button (default A) will let you play as Sonic alone, holding "Back" button (default S) and then pressing "Start" (default Enter) will let you play as Tails, and holding "Delete" button (default Q) and pressing "Start" will let you play as Knuckles. This is also the only known way to change character without using a save file or restarting from the beginning. 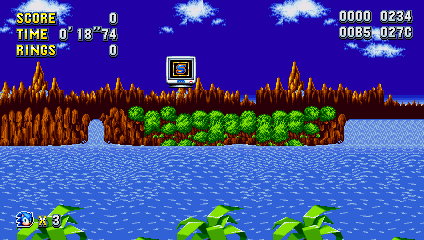 Green Hill Zone 1: Basically the same as the standard Green Hill Zone 1. Leads directly into Studiopolis Zone 1 with no fade-out. Studiopolis Zone 1: There's no music track for this stage. If the player does anything to cue new music (like hitting an invincibility monitor or reaching the end of the Act), the game will crash. If a music track is added in via modding, then once the Act is done, the game immediately goes back to the title screen after the score tally has completed. Stardust Speedway Zone 2M: The area used for the Metal Sonic fight. 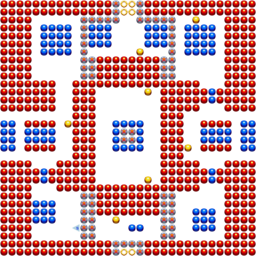 Titanic Monarch Zone 3: The final boss area. Special Stage: Play any of the seven Special Stages. 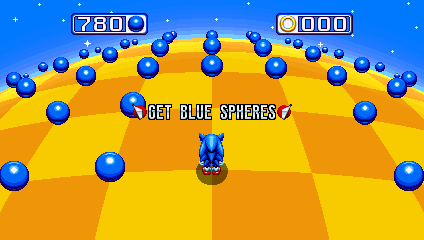 Blue Spheres: Play any of the 32 Blue Spheres stages. Also includes a "Random" and "Random 2" option. 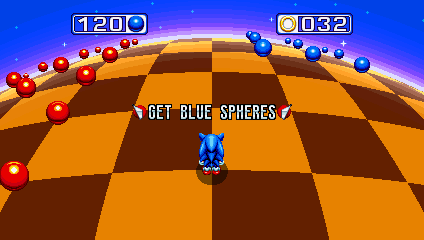 Random 2 will use the "Mania" mode of the Blue Sphere stages, which adds new spheres with different effects. Extras: Includes the unlockable Puyo Puyo mode and the D.A. Garden. Cutscenes: These are the in-game cutscenes, not the animated ones. Angel Island Zone: The cutscene at the start of the game. Green Hill Zone 2: The cutscene at the very end of Act 2. Mirage Saloon K Intro: Knuckles gets knocked off the Tornado. Oh no. SSZ Time Warp: The time-traveling cutscene seen at the end of Stardust Speedway Act 1. Try Again: Eggman taunts you and your lack of Special Stage skill. Videos: All of the game's animated endings. The Knuckles & Knuckles ending is labeled as "True End?" Video Settings: A few extra video options. Window Size: Options are 1x, 2x, 3x, and 4x. In the normal video menu, this only goes up to 3x. Window Aspect: Missing from the normal Video menu. Options are 16:9, 4:3, 3:2, 16:10, and 5:3. Fullscreen: A simple YES/NO choice. Screen Shader: The same options as the normal Video menu, except CRT-Sharp is named "CRT-Yeetron" and CRT-Soft is named "CRT-Yee64". Audio Settings: Volume slides, plus a "Streams Enabled" option that when set to "NO" will prevent any more music from playing. Configure Input: Configure those inputs! Debug Flags: Allows you to enable or disable layers and sprites. This option only appears in v1.04. You can always enable Debug Mode anywhere. Activating the developer menu also activates some other features, presumably used for debugging. Holding backspace will fast-forward the game, and pressing F12 will pause and unpause the game. While the game is paused with F12, F11 will advance it one frame at a time. If used on Steam, this will disable the screenshot function if the key is bound to F12. As of v1.05, while in a Special Stage, pressing the Super button will advance the player one mach. You can do this infinitely. Strangely, this does not require the debug menu or any cheats to be enabled in order to work, meaning one can easily stumble upon it accidentally in a normal playthrough, though it still only works in the PC version. These are the version numbers used in the debug menu. They are contained within GameConfig.bin. Yellow - Tiles that are solid from the top. Used for platforms. Red - Tiles that are solid from the bottom and sides. Usually for walls and ceilings. White - Tiles that are solid all over. Usually for the ground. The original version of Splats can be placed with Debug Mode in both Acts, separate from the updated Splats used in Press Garden Zone Act 1. 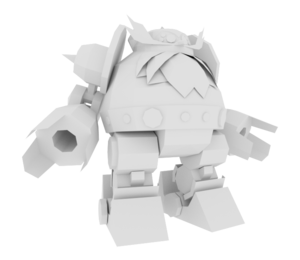 This version of the badnik uses its original unused sprites from Sonic the Hedgehog with no modifications, suggesting this badnik was scrapped early if it was ever seriously considered for inclusion in the Zone. Since the artwork hasn't been redrawn to account for the updated palette it displays incorrectly, with the lightest tan shade replaced with grey and one of the blue shades overwritten by one of the cycling colors used by the Zone's animated waterfalls. Interestingly, this version of Splats behaves differently compared to either version found in the Debug Mode of the original game's 2013 remake, suggesting this is more than just a leftover from the earlier game. The rolling ball can also be placed with Debug Mode. This functions identically to the version in the original game's 2013 remake, though it doesn't use the exact same graphics. A pond skater badnik that looks and behaves like a similar badnik in Tidal Tempest Zone from Sonic CD, Amenbo. It is named Sweep in the game's internal object list, presumably in reference to the Sonic Adventure enemy of the same name with similar function and coloring. It can be placed with Debug Mode in Act 1. This little guy will automatically snap to the water's surface and strides along in short bursts, occasionally stopping to fire its pointy nose forward like a missile. 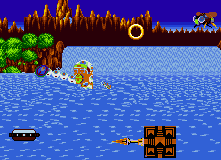 This badnik was eventually used in Encore Mode's Angel Island Zone, with a single Sweep placed on the water's surface in the lower route through the stage. Graphics for Act 2's Woodrow badnik are loaded in Act 1's enemy sheet. The only enemies which normally appear in both Acts are Dragonfly and Juggle Saw, Splats is exclusive to Act 1's sheet, and Carry is exclusive to Act 2's, so Woodrow's presence in both implies it was intended for both Acts at some point. LavaFall - a stream of lava that falls from the ceiling. TurretSwitch - a turret enemy that fires bullets when Sonic is near and activates a door when destroyed. Interestingly, both of these objects are used in the early version of Act 1 found in LRZ's stage folder. They can also be found in the stage's debug list. Caterkiller, taken directly from Sonic 1. Caterkiller isn't in the stage's debug list - it has to manually be added to StageConfig.bin. Because its sprites are located with the sprites for Metallic Madness, it is safe to assume it was meant to appear here. Monkey Dude from Sonic the Hedgehog 3's Angel Island Zone. It has smoother animations than the original, but doesn't seem to behave properly - you can't destroy it, nor can it damage you or throw its coconut. 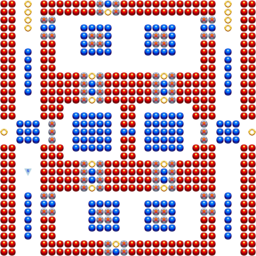 A completed version of this badnik was later implemented in v1.05, in Encore Mode's Angel Island Zone. Wisp from Sonic 2's Aquatic Ruin Zone. Behaves similar to the original, but flies away after a few attacks, similar to Shutterbug in Studiopolis. 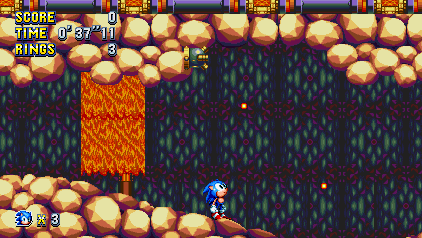 The spear blocks from Sonic 2's Metropolis Zone. Behaves the same. The colored pins from Sonic 2's Casino Night Zone. Behaves the same, minus sound effects. All of these objects use sprites from the now-absent Blueprint folder. The folder must be re-added for the objects to display properly. These objects are also not present in any of the stage's StageConfig - they must be added manually. The models have vertex colors. The previews need to be changed with colorized models. Wireframe mesh of Eggman's Mech appears at the end of Stardust Speedway Act 2 in Sonic Mania Plus. Needs to be compared with leftover model. Located in Data\Meshes\TMZ\ is an unused 3D model of the Mech seen in the background of Titanic Monarch Zone. According to Stealth, it was converted into a 2D image to be used in the final game. 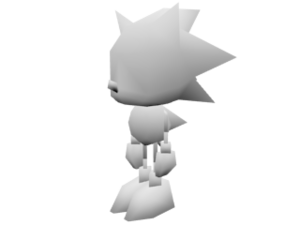 Located in Data\Meshes\Global\ is the 3D Sonic model used in Sonic Jam, likely used as a reference at some point. It's also possible that the developers were going to use this model in Special Stages instead of creating a whole new model. This track is listed in the D.A. Garden as "Egg Reverie Pinch Mode", which suggests that Egg Reverie Zone would have had two phases, but was scrapped. This track is listed as 2A in the Sound Test/Level Select. In the official "Selected Edition" soundtrack released to digital storefronts, the track is given the name "Egg panicky" and is noted to be only available through the Sound Test. Files Stage/Beep3.wav and Stage/Beep4.wav are used, but these two are not. While Stage/Electrify.wav (taken from Sonic 1) is used, this sound (taken from Sonic CD) isn't. This is pretty much just a lower-pitched version of Stage/ElecCharge.wav (also used) anyway. There are three different "ledge breaking" sound effects in the game. This is the one that isn't used. Tecnnically, this sound effect is used by the Stegway badnik, but said badnik is also unused. Basically the same sound as SSZ1/Flail.wav, but this version is 0.4 KB larger for some reason. The original sound effect for the sticky platforms in Chemical Plant Zone. 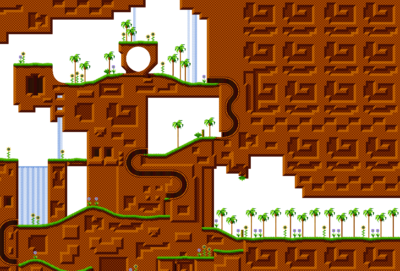 The final game uses Puyo/Land.wav to reinforce the Dr. Robotnik's Mean Bean Machine connection. Three sounds meant to play when the Spider Mobile is being bounced around the arena. This was probably supposed to be used when the Ball Hog's, well, balls, bounce off the ground. Earlier versions of existing sound effects left in the game. Interestingly, the early versions of the Grow and Shrink sound effects are the same ones used for the identically-named power-ups from Knuckles' Chaotix. Using a teleport box in 2P mode. Hitting a growth ray while shrunk in Metallic Madness Zone. Hitting a shrink ray at full size in Metallic Madness Zone. A callback to Sonic CD, Sonic says "I'm outta here!" 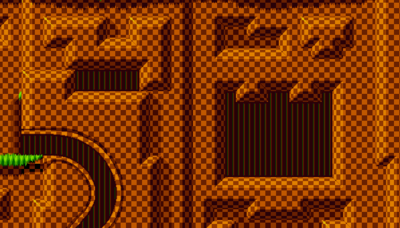 and jumps offscreen, causing an instant game over (although the "Game Over" text does not appear). According to a developer, this was in pre-release demos but was disabled in the final game, probably for the demo to restart after the player leaves the game. To activate it, edit the RAM memory at address 0A4D667 and change the value to 10. Interestingly, this can also be activated with Tails and Knuckles, though the outcomes differ. 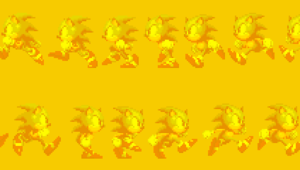 Knuckles will be swapped with various parts of his spritesheet and jump offscreen, causing a game over, while Tails' sprites also spaz out to different parts of his spritesheet, but does not jump offscreen. Since it was only used in the demo, it may be possible that Tails and Knuckles were never supposed to use this behavior, because most of the demo is only Sonic on the Player 1 spot (Tails was later playable in the Switch demos, but only as Player 2). And the sprite was not allocated to do that, causing the sprites to freak out. In v1.05, the animation is used on the main menu when scrolling over the "Exit" option in the PC version. If you try to make Ray and Mighty "Get outta here", Ray will jump as soon as he says "I'm outta here" while Mighty takes longer than everyone else. Interestingly, Mighty and Ray don't become a mess of sprites and instead use the sixth frame of their climbing animation for FBZ. Ray jumps into the background, and Mighty jumps forwards. The following strings are present in all language packs, but are always in English. Obviously intended for work-in-progress versions. This was probably used when trying to submit Time Attack scores before they were properly set up. GameConfig.bin contains the game's tagline alongside text used in the developer menu. This is a game dawg! The Switch version uses this phrase instead of the previous string. The executable of each build (on Steam at least) contains pdb file paths and filenames. An early Green Hill level design, similar to what was presented in the San Diego Comic Con demo, is located in the GHZCutscene folder in the file Scene1.bin. This is used for when the Phantom Ruby teleports you to Green Hill Zone in the intro, with the actual level being loaded afterwards. A secret area with a giant ring was removed from the final version, probably it's too obvious to find since there's a small grass in the wall. The first secret area above holds a giant ring in the demo and can only be accessed by pushing a rock. This was moved to the right for the final version, where it now holds 9 rings and a 1-up monitor; a long tunnel was removed to fit this change. The giant ring was moved down as a result, making it slightly easier to find. A secret area, most likely intended to hold a giant ring, was removed, as was a platform on the wall above the run-down ledge. The early area with a giant ring was re-implemented in Encore Mode. 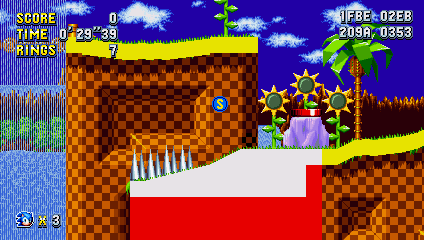 But interestingly, the area can now be found in the Mania Mode version of the final, only blocked off and inaccessible. Some areas of the lake appear incomplete. On the right side of the waterfall is a secret area, which was also probably meant to contain a giant ring. An early level can be found on Scene2.bin in GHZCutscene, used as a cutscene after defeating the Death Egg Robot. There are no major changes in the final version, just visual touch-ups. The full map can be seen here. A comparison may be needed for this one. Using the Dev Menu, going to Media Demo and selecting Studiopolis Act 1 will take you to an early version of said Zone, which is very similar to the one that was playable at PAX 2016 and early demos. 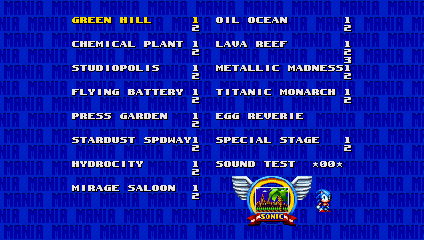 An early playable Lava Reef Zone Act 1 is accessible by swapping Scene1.bin with Scene2.bin in the LR1 folder. 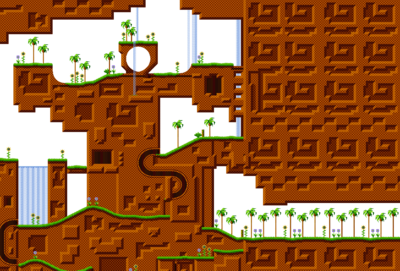 It is comprised of sections from the original Sonic & Knuckles stage alongside sections that wound up used in Mania, albeit with glitched graphics. It also makes use of the unused turrets and lavafalls not seen in the finished level. The background music starts playing incorrectly after the first loop, likely due to an improper loop point. The boss also appears and seems to work normally. The names for the chemical pools in Chemical Plant Zone Act 2 reveal that the colors were changed: ChemRed.wav is used for the green chemical pools, and ChemYellow.wav is used for the cyan chemical pools. This could also refer to red and yellow springs, respectively, which both of these elements behave like. Press Garden Zone's music files are internally called PulpSolstice1 and PulpSolstice2, and its sprite folders are called PSZ1 and PSZ2. This suggests that the Zone was once called Pulp Solstice Zone. The internal name for the electrical conduits in Flying Battery Zone Act 2 is, confusingly, "Tuesday". Most internal references to Heavy Magician refer to her by the alternate name of "HeavyMystic", while the version encountered during the boss of Titanic Monarch Zone Act 2 is "PhantomMystic", indicating that the character's official name was changed at some point. This is further supported by Stealth accidentally referring to her as Heavy Mystic instead of Heavy Magician during a livestream. There are four unused Blue Spheres stages in the game. They cannot be accessed through the DevMenu; the only way to load them in-game is by renaming their SpecialBS files. 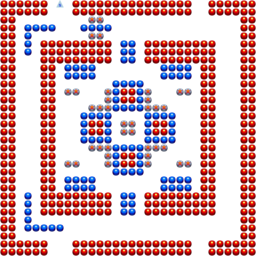 Apparently a test level, composed of a large area full of blue spheres and a cross-shaped line of red spheres. It is impossible to get a Perfect here. All of these stages appear to be complete, but go unused for whatever reason. This page was last modified on 18 April 2019, at 22:13.